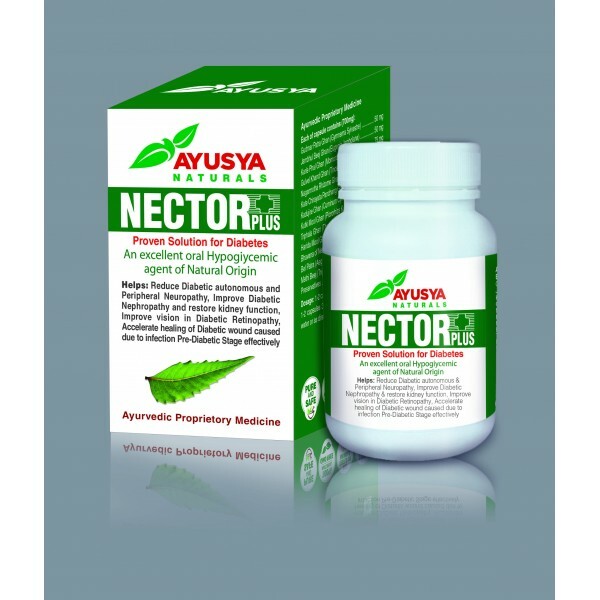 NECTOR PLUS is an excellent oral Hypoglycemic Agent of Natural Origin. It has no side effects., Reduce diabetic autonomous & peripheral neuropathy,Improve Diabetic Nephropathy & restore kidney functions.Improve vision in Diabetic Retinopathy.,Accelerate healing of Diabetic wound caused due to.,Microangiopathy and Infection.Reduce all Diabetic complications very quickly. Cure Pre- Diabetic stage. Benefits Of NECTOR Even with high doses Nector Plus does not have hypoglycemic complications. It does not have drug resistance or drug intolerance & does not render other drugs incompatible with its effect.